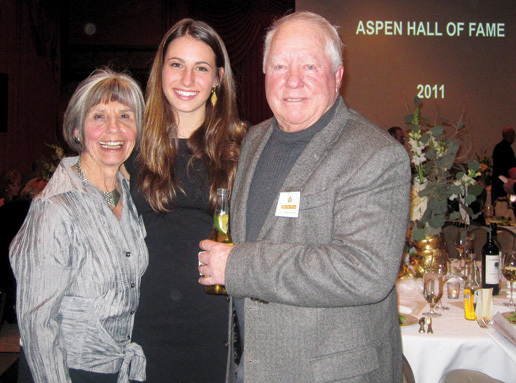 Named to the 2011 Aspen Hall of Fame were Marsha and Jack Brendlinger and Bob Lewis. The annual banquet was held Jan. 22 at the Hotel Jerome, with the Brendlingers being inducted in person and Katie Lewis Etienne accepting the honor for her father. The Brendlingers have been active in the Aspen community since settling here in 1963 and building the Applejack Inn. Marsha served on the school board and Jack instigated the Aspen Ducky Derby for the Rotary Club. Both the Brendlingers directed and choreographed several high school musicals. Marsha also taught dance for years while Jack was active with the media such as Freewheelin Films and New Vision Syndication. Bob Lewis was known as a longtime local visionary and environmentalist. He created and led organizations such as the Independence Pass Foundation, the Wildwood School and the Aspen Field Biological Laboratory. He was instrumental in founding the Aspen Center for Environmental Studies. The Aspen Hall of Fame honors individuals who have had a significant and lasting impact on the Aspen and Snowmass communities – economically, physically, spiritually or intellectually. They must have demonstrated inspirational leadership and made major contributions to cultural, sports, and/or civic activities. Undercurrent … It’s time to start planning your spring getaway.